Ballard Jazz Festival is fiscally sponsored by Shunpike, and therefore, tax-deductible contributions may be made to the Ballard Jazz Festival through out page at on the Shunpike website. Your support will help us achieve our goal of building a membership base and insure the longterm health and vitality of jazz in Seattle through the Ballard Jazz Festival and other events. 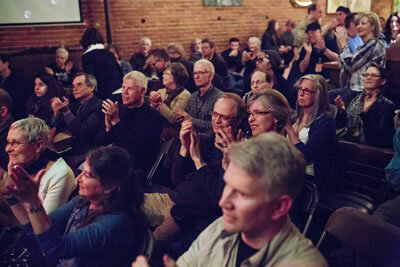 Become A Ballard Jazz Festival Founding Member! If you prefer to mail a check, please make checks payable to: Shunpike (Ballard Jazz Festival). Reminder: If you work for a company that matches your donation, your contribution goes even farther. With your membership in our Founder's Circle, we'll have gifts and festival passes to accompany a very large THANKS from all of us as we work together in support of Seattle's uniquely vibrant jazz community. And don't forget, if you work for a Matching Gift Company your contribution goes even further! Showcase your business' community participation at the 2016 Ballard Jazz Festival. Click here to find out more about becoming a Corporate Sponsor. We'd love to have your help at the Jazz Walk or Mainstage Concert. Click here to sign our Volunteer Form. Contact for more information about Ballard Jazz Festival Sponsorships.